Two more Dodgers go to heaven. RIP: Cliff Dapper. Via Inside the Dodgers, we learn that former Brooklyn Dodger Cliff Dapper recently passed away. He is famously known for being the only ballplayer traded for a broadcaster- Hall of Famer Ernie Harwell. "Gino was a part of history not just as a member of both the Brooklyn and Los Angeles Dodgers, but throughout the game of baseball because of his role in the first-ever big league game on the West Coast," a Dodgers spokesman told ESPNLosAngeles.com when asked about the Chronicle's report. "The rivalry between the Dodgers and Giants picked up where it left off in New York and Gino was the fortunate one to lead off that afternoon in his hometown. Last years National Sports Card Collectors Convention in Baltimore was a rousing success for the city. It provided the greatest economic impact of any convention held there last year. Via Sports Collectors Daily. Cardboard Junkie realizes that the Braves will likely win and lose their 10,000th games as a franchise this season. Kevin Glew's "Cooperstowners in Canada" blog writes about Walter Alston and his time as skipper of the Montreal Royals. 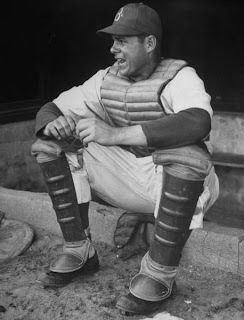 Here's another great post about Duke Snider- "The Duke of Delorimier." David Pinto analyzes James Loney's propensity for hitting line drives, via BaseballAnalytics.org. There was such high hopes in LA when Darryl came to LA. Alas, it was not to be. Darryl Strawberry's career regressed progressively until he was finally released by the Dodgers in the middle of his contract in 1994. There was one good year, though, in 1991 he belted 28 home runs and knocked in 99 runners. Good for 9th in MVP voting that season. Here is my 2004 Donruss Classics auto with game-used uniform piece card from my collection. It is numbered 95 out of 100.